Yeovil 0 Arsenal 3, a publicity seeking chairman, and a journey to the double. 6 January 1971: Yeovil 0 Arsenal 3 FA Cup round 3. The chairman does his thing. The game of the minnows from outside the football league playing the aristocrats of division 1 could have been a nice friendly and warm affair but it wasn’t. Yeovil at the time were in the Southern League, but I can’t locate a the Southern League table for the date of the game, although I suspect they were first or second, for the simple reason that just as Arsenal won the League in 1971 so Yeovil won the Southern League Premier Division by two points from Cambridge City in that season. Perhaps it was because Yeovil were challenging to win the league having been runners up the year before than their chairman decided to hype up the match – when in reality there was no need to hype it up at all. This was the era when the Cup really did get full grounds and had everyone enthusiastic – very different from today (2014) when as we have seen grounds have rarely been full, even for Arsenal v Tottenham in the third round. His main approach was to criticise two of the most highly respected and liked members of the Arsenal team – Frank McLintock and Bob Wilson, suggesting that the latter was “slow to fast balls”. Then, as the final wind-up the chairman personally turned up to meet the Arsenal bus and shake the Arsenal players by the hand. Not everyone did so. Although it got the chairman, who was a JP and ran a business as a glove maker, the publicity he so desperately craved, it did nothing for Yeovil’s reputation in the wider world of football, and there was a clear change in attitude with the general feeling emerging that the man had gone far too far. Yeovil also had one other advantage – at least by reputation – a slope across the pitch, so that one touchline was considerably higher than the other. In order to overcome this problem Don Howe took all the Arsenal players onto the pitch some three quarters of an hour before the game, and had them knocking balls from left and right into the box for Bob Wilson to take. They quickly got the hang of it, seeing how differently a cross from one side would move as opposed to a cross from the otherwise. But there was another benefit. The Arsenal fans had inevitably got into the ground early, and were delighted to get the pre-match entertainment from the team, and so cheered every moment of the warm up. Meanwhile Yeovil were preparing to do the normal thing of warming up in their dressing room before a five minute kick around prior to kick off. Yeovil undoubtedly heard the roar of the crowd (the Arsenal end containing a bigger and far noisier contingent than Yeovil normally had in the entire stadium). Members of their staff ran out to see what was going on, and there was some uncertainty in the Yeovil dressing room about how to respond. Eventually they decided to do nothing, and continue with their normal routine, but in effect Don Howe’s move took the psychological advantage away from Yeovil and gave it to Arsenal. The game itself was, as a result of this manoeuvre, not the dramatic free-fall of Arsenal that the press wanted, and Arsenal easily won with two from John Radford and one from Ray Kennedy which started the journey towards the double (although there certainly wasn’t anyone talking that way at the time!) Arsenal didn’t swamp Yeovil, they just killed the game off early on, and that was that. As for Norman Burfield he had been elected chairman of the club in 1969, and having performed his antics against Arsenal, and then seeing the club win the Southern League Premier Division in 1971, he also found himself awarded an MBE in the same year for services to export. Having achieved all that he then stood down as chairman, becoming club president, and overseeing the club’s move into the Football League in 2003. He died in 2009 aged 90. 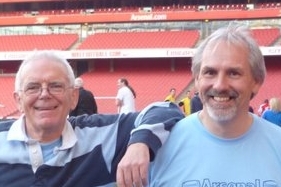 2 comments to Yeovil 0 Arsenal 3, a publicity seeking chairman, and a journey to the double. 1971. Whether it was that awful pitch or not, NO-ONE liked to drawn there in the Cup, whether top division club or not and I daresay the same view exists today. Yes Nicky I agree, no one wanted to go there. I actually went to the ground a few times myself when I lived across the border, in Dorset, and even in Southern League games, they were tough opponents at home.